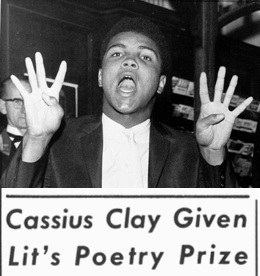 The Yale Literary Magazine announced that pugilist Cassius Clay, aka the "Louisville Lip" (later known as Muhammad Ali), had been awarded the Ephraim Barnard Gates Award, given to the person "who has done the most to revitalize poetry during the last year." The award committee cited "his mockery of the loose trochee, culminating in shocking spondees in the penultimate lines, and the final heavy line in irregular iambics" which produced "stanzas almost perfectly orchestrated." The Literary Magazine explained that the Ephraim Barnard Gates Award was a little-known prize, presentation of which had been discontinued after the Civil War but which had been revived in honor of Clay.